^ "Opera 59 codenamed Reborn 3 reaches beta stage". 2019-02-28. Retrieved 2019-03-11. ^ "Opera 60.0.3248.0 developer update". 2019-03-05. Retrieved 2019-03-11. ^ "Desktop & Tablet Browser Market Share Worldwide". StatCounter Global Stats. Retrieved 2019-04-03. 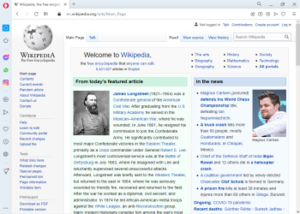 This page was last edited on 19 April 2019, at 11:08 (UTC).